So today’s haul was a surprise haul done by my hubby all by himself just to surprise me with the things I like and love using! The thing was that he went and bought some things for me which was mainly makeup- Colorbar lippies, nailpaints, illuminating lotion and many more. He just picked the shade without even seeing the colors, I know he must have picked them without seeing the shades as he don’t know much about makeup so he just picks whatever he sees in front of him just to make me happy. He bought all the stuffs alongwith the Colorbar box and gave me a surprise but I instead of being happy got frustrated seeing the bad shades he picked for me! Read the rest of the story below ;) I got really frustrated as both the nail paint and lipstick shades were just not at all my type and that illuminating lotion, oh no I didn’t want that as I don’t want to enhance my flaws using a highlighter! I was like, you could have at least asked me before buying things for me or just ask me to make a list and then surprise me by handing over those stuffs to me. He was like- Oh I thought you would get really happy and excited seeing these products but no, you are again upset. He said okay don’t worry, you can come with me tomorrow to the same cosmetic store and I will get your things exchanged with whatever you want! I was relaxed that at least now I can choose what I want and don’t have to use what all he got for me. I went to that store with him and picked the stuffs I wanted to buy and stuffs that caught my attention. So in skincare, I picked these things among which the Colorbar products were brought by my hubby! That’s all for this skincare haul, will be doing the surprise makeup haul in a separate post!! PS: I love my hubby for these little surprises. Yesterday he got me a black designer suit which caught my attention when it was on the display and he surprised me by gifting it to me! Hehe ya I really appreciate him. Suit toh is really gorgeous, I’m really excited for it! Thats really cute! 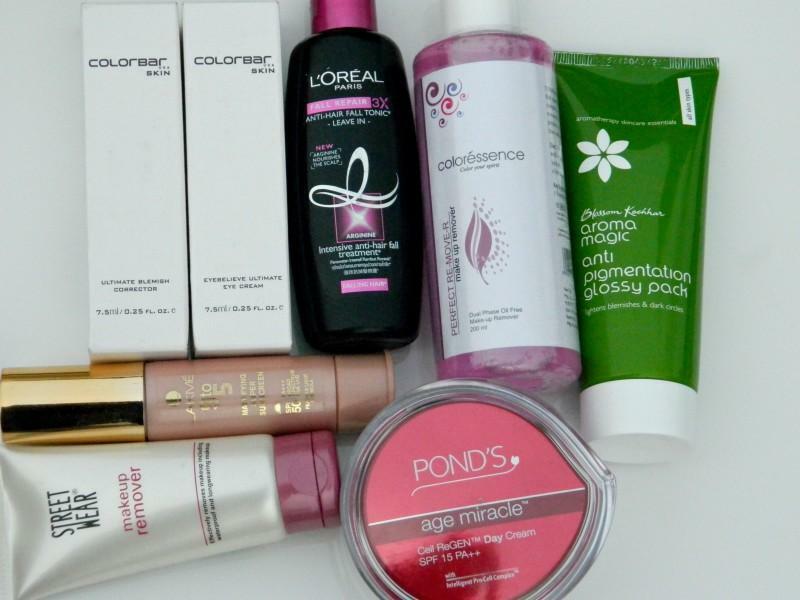 !Very nice haul indeed.would be curious to know about the Colorbar products. pls review the aroma magic pack soon..waiting.. Ya true, husbands and BFs should really dive deep inside their girl’s mind if they want to gift them something special. Awww that’s so sweet of him. He’s a keeper!